I'm on my Coastal Scents kick, and wanted to do a strong green look, which I haven't done in awhile. Some people do not enjoy wearing green but if you pair it with the right shades to make it richer and add more depth, it is incredibly flattering on all skin tones. This is also a great look for brown eyes. Step 1: Apply a mossy green base to the lids. 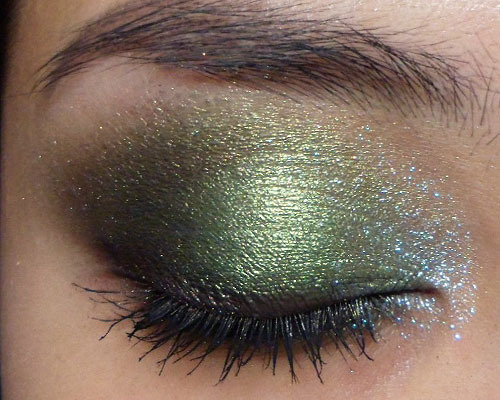 I used MAC Paint Pot in Moss Scape, but any olive green or khaki pencil or cream shadow would work. Step 2: Gently brush on a rich metallic forest-green like Coastal Scents Kiwi Green Hot Pot. Step 3: To add some depth, I used a burgundy-brown, Coastal Scents Raisin Berry, to deepen the outer corners and along the hollow of the eye socket. You can use a regular brown but the green will make it olive/khaki, so I used a burgundy instead as it shows up richer. See the rest of the tutorial here! The use of the burgundy brown is beautiful, it really added dimension. Thanks! I was thinking of a couple of friends who said they were afraid of greens and I was telling them "No... don't wear it all alone as a wash!" LOL.